The Living Well App is specifically designed to assist men who have been sexually abused in childhood. We know that childhood sexual abuse can have a profound impact on men’s lives and relationships. However, we also know that men who have been sexually abused can live rich, full lives, develop healthy relationships and make positive contributions within our communities. This App is designed to complement, not replace, the work of a qualified health care professional (see Terms and Conditions below). Please contact your doctor or a health care practitioner if you are concerned for your own or another person’s mental well-being. Provided here are practical resources and suggestions that men who have been sexually abused can make use of. The information and resources draw upon research evidence and practice knowledge to offer suggestions that can enhance well being and help better manage difficulties. We encourage you to share information and strategies. The App is designed to be useful for partners, family members, friends and health care professionals – for anyone looking to enhance their understanding and personal well being. We invite you to check it out – work your way through the App and become familiar with what each section has to offer. The Well-being section is a good place to start and make regular use of. This section details some things that you can do to improve your health and well-being. Research tells us that having these building blocks in place leads to enhanced quality of life. Our decision to foreground well-being is based on a knowledge that living a fulfilling, connected, active life is possible after sexual abuse and we do not wish to accept a lesser goal for all those whom we live and work with. The Well-being section is broken up into a number of different sections, each with information and resources that you are encouraged to make use of. There is no one path to health and well-being. We encourage you to become familiar with what each section has to offer and to work on establishing a routine that works best for you. Some aspects of this section might take perseverance. By placing a focus on doing things that support your well-being, there is no suggestion that problems will just disappear – that’s not possible. It is about building solid foundations that can help you better deal with problems when they do arise and keep you on track for living the kind of life you want to live. This assessment tool uses the Warwick-Edinburgh Mental Well-being Scale (WEMWBS) to measure well-being. Good mental well-being – some people call it happiness – is about more than avoiding mental health problems. It means feeling good and functioning well. To get a well-being score, read through the statements and click on the box that best describes your thoughts and feelings over the last two weeks, then click next to continue on through the 14 questions. You will receive information at the end that will provide an assessment of your current well-being and what you can do to enhance it. The WEMWBS is an internationally validated assessment of well-being that utilises strength based language less likely to be triggering or distressing for those who have been traumatised. By integrating and promoting use of the WEMWBS, we are very much aware that childhood sexual abuse and sexual assault can profoundly impact on an individual’s mental and physical well-being. The Learning section of this provide details some of the particular difficulties people who have been abused can face, as well as some ways of addressing these. The WEMWBS questionnaire for measuring mental well-being was developed by researchers at Warwick and Edinburgh Universities (see Tennant R, Hiller L, Fishwick R, Platt P, Joseph S, Weich S, Parkinson J, Secker J, Stewart-Brown S (2007) The Warwick-Edinburgh Mental Well-being Scale (WEMWBS): development and UK validation, Health and Quality of Life Outcome; 5:63 doi:101186/1477-7252-5-63). The Warwick-Edinburgh Mental Well-being Scale was funded by the Scottish Executive National Programme for improving mental health and well-being, commissioned by NHS Health Scotland, developed by the University of Warwick and the University of Edinburgh, and is jointly owned by NHS Health Scotland, the University of Warwick and the University of Edinburgh. The WEMWBS is subject to copyright. We are grateful that we have received permission to use and make available the WEMWBS. Read more about the WEMWBS. This section provides some basic information about childhood sexual abuse, common impacts, difficulties and challenges that men who have been sexually abused in childhood or sexually assaulted as adults can face. We have also included some discussion of different ways of coping, as well as questions and suggestions to help you think through and deal with these challenges. In order to get the most out of it, we encourage you to think about the right time and place to read the different parts of the learning section. Place a limit on how much you read at any one time and take some time – 10 minutes or so – after reading, to reflect on what you’ve read and whether it is relevant or helpful to you. We have included the facility for you to make your own notes as you read through. We encourage you to keep a record of your reflections and what works best for you. Consider, whether reading the learning section on your own is going to be best, or whether it will also be useful to talk stuff through with a supportive friend, partner or health practitioner? Plan to do something fun, relaxing or energizing after you have read through a few sections. It could be something you can do alone or with a friend. When reading through the learning section, remember not everyone is confronted by the same problems. Make use of information that is useful for you and leave to one side anything that is just not relevant. This section provides suggestions and guidance to help better manage some common difficulties that can confront and overwhelm men who have experienced abuse and trauma. We know that sometimes distressing memories and thoughts can make it difficult to connect with people, stay on track and focus in the present. We know that sometimes feelings such as sadness and anxiety can take hold and overwhelm our current resources and that difficulties and distress can vary throughout the day. We have therefore included a tool kit of suggestions for better managing difficulties. When you visit the Manage difficulties section, you will be presented with a list of common difficulties. We know that a number of difficulties can appear at once, so we invite you to click on the one that is most pressing at the moment. When you tap on a particular difficulty, you will then be asked to ‘Rate current level of distress’ on a sliding scale of 1-10. Zero means the distress is ‘not intense at all’, whilst 10 means ‘the most intense you have felt’. Depending on the rating and specific difficulty identified, the App will offer a series of suggestions. Given that men are such a diverse group and that problems can be varied, there is no single prescribed way of resolving difficulties. Keep this in mind and trial suggestions until you find one that works for you. It is useful then to book mark favourites for future reference – your favourites will subsequently appear first when you are seeking to manage a similar level of distress in relation to that particular difficulty. Note: Whilst this section provides an immediate response to what is going on now, establishing and maintaining a positive, connected well-being routine is worth investing in as it will help reduce and better manage difficulties in the long term. Putting aside some time just to breathe can sound like a ridiculous suggestion, as we all breathe every day otherwise we wouldn’t be alive. However, when people have been sexually abused or been subjected to prolonged trauma they can get in the habit of taking only shallow breaths. Always remaining alert, rarely getting air deep down into their lungs, where it can provide oxygen to the brain and body. Sometimes, when people have been sexually abused or sexually assaulted listening to people talking them through relaxation or mindfulness exercises can be difficult. Just listening to someone speaking slowly and gently can set off a whole load of unhelpful talk in your head, especially if those who perpetrated abuse manipulated the situation through speaking kindly or by pretending to be a supportive adult or friend. Taking time to settle and physically calm yourself is valuable when you are feeling stressed, anxious, agitated or angry. Taking Time2Breathe for just a couple of minutes will have a calming effect that helps create room for the front of your brain to work. When the front of your brain is engaged you will be in a better place to consider options and make choices that are helpful in both the short and long term. The Time2Breathe function is designed so that you can adjust the number of breaths or beats per minute and the length of time you wish to do the exercise. This is not something you have to spend lots of time on, just a couple of minutes of breathing in and out in time with the beats can help calm your body and mind. If you can, incorporate taking Time2Breathe into your daily routine, be it when you get up in the morning, during a break from work, on the way home or at the end of the day, that’s great. Book in a regular Time2Breathe. You can also make use of this function whenever you feel stressed or agitated,, when you notice yourself becoming anxious or find yourself struggling with unwelcome or unhelpful thoughts. It’s good for us all to settle ourselves and take someTime2Breathe. Everyone benefits from being connected and accessing support at different times. A little of the right support at the right time can help us settle and quickly get back on track. Sometimes you might be the person accessing support and sometimes you might be the person offering assistance and encouragement. Support works best when it is personalised to meet our particular needs, interests and circumstances. Take a little time to populate this support section with trusted people from your contact list (don’t forget to include any health care providers you are currently working with). Set up the App, so that it includes music and images that you find supportive. Check out ‘How music can support our well-being’ in the Well-being section and create your own playlist from your music collection on topics such as ‘Music to calm me’ or ‘Music to energize me’. Telephone numbers of valued friends, supporters, professionals from your contact list. Images and photo of important people, pets and places that you have selected. A collection of calming and inspiring images. The community blog offers further information and inspiration, encouragement and hope. It is a place to keep up to date with the latest initiatives and ideas. It is a place where you can offer encouragement and hope to other men (anonymously if you wish), where you can post comments, quotes, stories, inspirational images and videos. For ease of access and to increase interactivity, the blog is best accessed via the free Tumblr App. The blog is all about building communities of support offering encouragement and hope. It is designed to help make the App more dynamic – ever improving and evolving. It is an opportunity for you to help make a difference. We value and welcome contributions from men and women, from individuals, groups and organizations. Settings buttons allow you to manage reminders for the well-being section, the self assessment and booking in the Time2Breathe. It’s all about making the App work for you in your day to day life. The Living Well App was developed with the financial support of the Australian Commonwealth Department of Social Services and the Community Services Commission of Anglicare Southern Queensland. Living Well, is one of the innovative and specialist services developed and supported by Anglicare Southern Queensland. 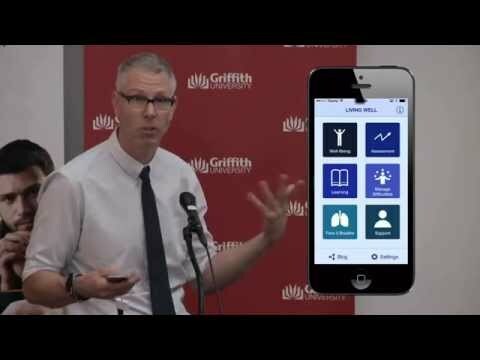 The App was designed by Gary Foster PhD, with the assistance of Cameron Boyd PhD, Kent Smith, Janine Hills. Hugo Teixeira, Jess Decker and the team and clients of Living Well. Living Well, 1in6 and 1in6 Canada are working together to build communities of support offering encouragement and hope to men sexually abused in childhood, to partners, families, and friends. A tangible example of this joint commitment is the www.1BlueString,org initiative. In order that we might improve the effectiveness and functionality of future versions of the App, we are interested in hearing from you about how you rate this App and what you found useful or not. It will only take a couple of minutes. Please fill in the feedback form to send us your comments. You can also use this form to report problems and get support for the App. We have made the Living Well App available for free. We believe that everyone who has been sexually abused or sexually assaulted should have access to quality information and support, whatever their current circumstances. We are interested in partnering and working with like minded organizations to improve support to people who have been sexually abused in childhood. We would welcome the opportunity to create an enhanced version of this App. We recognize also that people value the opportunity to contribute and to support further development of this App and our services. McMackin R.A., Newman E., Fogler J. M., & Keane T.M. (2012) Trauma therapy in context: the science and craft of evidence based practice. American Psychological Association: Washington. Please take a look at the Living Well App Terms and Conditions of use. Thanks for your support! The current app does work on some tablets but not all, unfortunately. Expanding for tablets is something we have explored and would absolutely love to happen in the future. We’ll be sure to let you know when it does!